The purpose of this website is to provide the NASA community with information about recent failure incidences affecting NASA's flight hardware. Through this information, failure mechanisms associated with electronic wire bonds will be presented. General information about wire bonding technology is provided to give background information to those readers who are not familiar with it or with the vast amount of literature available on this topic. Note: This site is not intended to provide every detailed aspect about electronic device wire bonding, though it contains general information. Only topics and problems of interest to the GSFC community will be highlighted and discussed in this site. 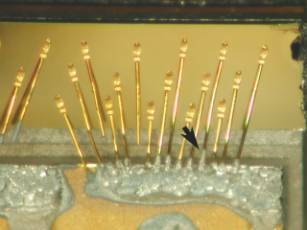 Laser Diode Pump Assembly: Indium is found to be the culprit in intermetallic growth on gold wirebonds which led to shorts in the assembly and fused wirebonds. Contamination-enhanced growth of Au/Al intermetallics and Horsting voiding: In 1972 C.W. Horsting published a paper about a new type of void, not be confused with Kirkendall voids, that can cause wire bond failure. Contamination in Bond Pad "dimples" Bond pad features were found to harbor contamination causing "poor" bonds. Watermelon stripes also linked to contamination. Reduced pull forces due to shallow bond angles. Very "flat" bond wires use a different bond pull test criteria than is used with wires with typical stress reliving loops. Intermetallic material formed from Indium solder coming in contact with Gold wire bonds. The links in this part of the site provide introductory information about wire bonding technology. The amount of information in the scientific literature about wire bonding technology is vast. George Harman's Wire Bonding in Microelectronics Materials, Processes, Reliability and Yield, 2nd Edition, McGraw Hill, 1997 is an excellent place to start for the casual observer as well as professionals in the electronic parts industry. Dr. Harman has allowed us to share some of his collected references in our Literature Reference section as well. Gold Wire Vibrations Long wire bonds examined for resonant frequency within box-level vibration test spectra. Webmaster: Carl M. Szabo, Jr.